Hardly. According to Ke$ha it must be because I don’t brush my teeth with a bottle of Jack. 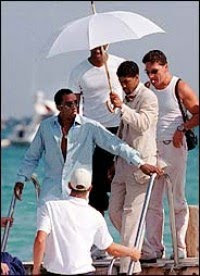 Of course, it could have something to do with the fact that I don’t have a career like P. Diddy, or perhaps it’s because I don’t have someone to hold an umbrella over my head to block the sun like P. Diddy does–where do I get one of those? So after years of taking music classes in high school, college, and even in grad school, I should feel ashamed to say that I like Ke$ha’s catchy little tune TiK ToK, but unfortunately, I’m only human. I bought the song when I saw it was number one on itunes. Yes, that’s a common problem for me. If I see that something is number one on itunes I almost HAVE to have it! I need to know what other people are listening to. I think I do this so that I can feel like I’m still cool and hip as I continue to age. I don’t know if it’s working but I’m definitely a little poorer for it–another thing that I don’t have in common with P. Diddy. I am kind of sad that my education didn’t get the better of me on this one. I’m not talking music education either, just the fact that Ke$ha’s name is spelled with the money sign, and that she obviously spells TiK ToK wrong. Millions of children everywhere are now going to be unable to spell the words tick and tock properly. Trust me, I know what I’m talking about. The constant misspelling of my name by EVERYONE can be fully credited to another famous pop starlet. I cannot just knock the spelling errors though, Ke$ha’s singing–if you can call it that–is nothing more than a combination of chanting and grunting in a valley girl accent. The overly synthesized music is completely underwhelming too sounding like all club music, and the lyrics are as superficial as they come–sorry P. Diddy. I can’t be a hater though, I have in fact “jammed” to this song in my car on a number of occasions. Moral of the story, if you buy Ke$ha’s TiK ToK and listen to it enough, you too will like it. « Don’t Rain On My Parade!